Showing your appreciation is all about sending the best. For foodies, nothing does it quite like a gourmet basket full of new flavors. 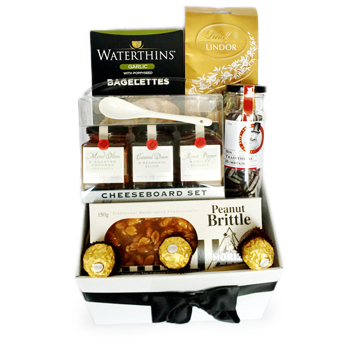 Pamper your hard-working employees or VIP customers with a basket bursting with goodies, from a jar of tempting mixed Olives & Roasted Peppers, savory Ogilvie Roast Pepper & Chilli Preserve, decadent Ferrero Roche Chocolates, an assortment of Lindor Chocolates, and so much more. Thank them for their hard work, remind them how much you value them, or pamper them just because with A Stylish Gourmet Hamper.